The stabilized operating temperature of a bearing is the result of many factors. The key influences on operational temperature are bearing style, lubrication type, operational factors, environmental conditions and level of maintenance The particular bearing style (ball, roller, sleeve, etc. ), the shaft mounting style (slip fit, adapter mounted, press fit, etc.) and auxiliary items (housings, seals, shields, flingers, etc.) all contribute to a final operating temperature. For a given set of application conditions, a particular bearing type will generate friction given off as heat. 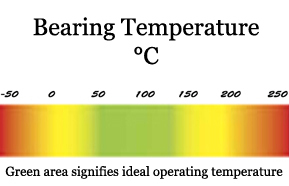 A typical bearing temperature rise range would be 40° to 80°F (4° to 27°C) for most industrial applications. However, a bearing temperature rise over ambient of up to a 120°F (49°C) can be observed at extreme conditions. It should be noted when bearings operate at higher than normal temperatures, service life may suffer due to a deterioration of the lubricant oil film thickness and quality. The initial bearing selection should either be chosen with adequate design life hours to compensate for the anticipated reduction in service life or an appropriate lubricant for high temperature operation should be selected. Bearings may be exposed to abnormally high ambient temperatures or elevated temperatures in equipment such as furnaces, fans, ovens, blowers, steel mill/foundry casters, roll out tables, dryers, electric motors and generators, to name a few. In many of these cases, bearings are expected to operate above the limits for standard bearing products. If at all possible, locating bearings out of the immediate heat zones or providing provisions to reduce bearing heat are preferred means to achieve optimum bearing service life performance. This can be accomplished by insulation procedures to reduce radiant heat. Also, shaft heat flingers or cooling wheels coupled with heat resistant shaft materials can reduce bearing temperatures. The use of water or air cooled bearing units is another method to reduce bearing temperatures to a more manageable range. Though these steps incur higher installation costs, long term benefits may be gained by reducing lubrication and maintenance problems often encountered with high temperature bearing applications.